Second generation larvae of the imported willow leaf beetles (Plagiodera versicolora) are munching the leaves of wild and cultivated willows in southwest Ohio. This native of northern Europe was first found in the U.S. in 1915. Since that time, it has become well established throughout most of the eastern and Midwestern states. This beetle has a history of periodically achieving population outbreak densities and causing significant defoliation of its namesake host in Ohio. The shiny bluish-black or bluish-green adult beetles chew holes or notches in willow leaves. The tapered bluish-black larvae skeletonize leaves and typically cause more damage than the adults. 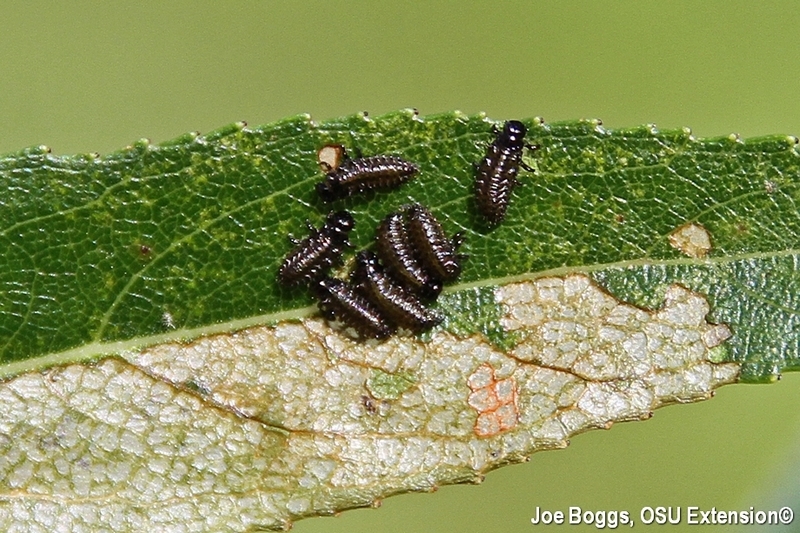 Young larvae may feed side by side and move as a group across the upper or lower leaf surfaces. Heavy infestations cause leaves to turn brown and appear scorched. Damage caused by the beetle can become significant since two or three generations may occur in Ohio. Standard insecticides labeled for willow are effective in managing this pest, as well as insecticidal soap sprays if applied to the larvae.